I’ve focused on percentage of use before. It’s based on the reality of what you use and need most often. Browsing for and buying new products is a great way to pass the time, but very seldom do you really need the new widget, and very seldom is the “latest and greatest” actually better or more suited to your core purpose. If you want to buy new stuff, then buy new stuff. I do it myself. But at least recognize that a high percentage of time, in the field, you’re actually using and needing (and wanting) the same trusty, basic gear and tools that you’ve come to rely on based on reality not fantasy. 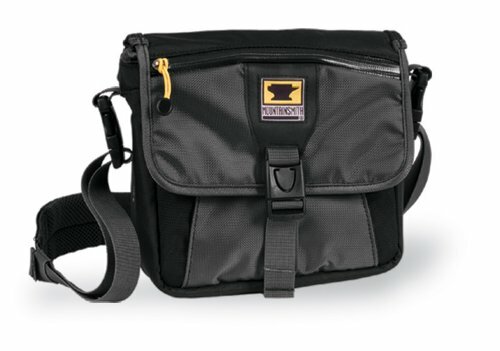 I began carrying a “man bag” years ago, and despite the fact that I’m usually the only man within a mile’s vicinity (or 50) toting one, I’ve found it immensely practical, and so I never leave home without it. Never leave home without it…? No. Except when I’m hiking in the woods. The basic why: For ankle support. Waterproofing is not the main reason. Protecting your ankles from twists and sprains is the main reason for good supportive boots. They don’t need to be leather with a waterproof liner (although both features are handy), nor do they need special soles other than fairly stiff ones with good traction. Reasonable packers try hard to keep their feet dry. We avoid slogging through puddles. Waterproofing is only really necessary if you plan to hike in the rain, and on the average day hike the sun is shining brightly. No amount of waterproofing will keep your feet dry if you try to cross a creek over fallen logs and slip off and in. 2) Lumbar pack or small backpack. 3) Apples, bananas, or other small food. The basic why: You or someone you’re hiking with (perhaps a child?) may need food. Repeat…MAY NEED FOOD. I’m not talking about because you might (it’s unlikely, i.e. low percentage of the time, based on reality) fall and break your leg and have to survive for days until rescued. I’m talking about getting out into the wood about 3 miles, loving it, wanting to keep going, but your (or someone else’s) blood sugar is getting low. Having food with you AT ALL TIMES can allow you to keep hiking rather than turning back before you’re ready. This situation will happen if you leave your car enough times without food and hike off onto a nature trail on a bright and sunny day. When you have to turn around because you didn’t pack two apples, you’ll kick yourself hard and never forget again. I recommend keeping a few fresh apples or other small food in your car at all times. The basic why: This is common knowledge. I recommend having fresh water in bottles at all times. If your pack does not have bottle holders, get a bottle that you can clip onto your pack with a carabiner. You don’t want to have to carry it in your hands the whole time. Fill up before you hit the trail. 5) Trekking pole or walking staff. The basic why: Fending off lions. I’m not kidding. You should feel naked in the backwoods without a staff in hand. As a side benefit, they’re fun to carry and sometimes helpful in walking. Don’t kid yourself by saying you need it to walk. You’ve been walking since you were a toddler. Say you need it for possible defense, and then you’ll be speaking realistically. Possible is the key word. Yes, it’s unlikely, but when a cougar (or a rabid possum–no joke) starts growling at your kid, you’ll feel like a fool if you have to scramble for a stick because the cougar’s not afraid of your swinging arms. This is serious! The failing lies in being prepared only some of the time. “Oh,” you say, “I’ll just find a hiking stick along the trail.” I’ve done this myself, many times. But for the size, weight, and convenience of modern, retractable trekking poles, just buy one and slide it through the lopes of your pack. If you’re willing to keep a nice hickory staff in the trunk of your car, it won’t break as easily when you smash it over the snarling assailant’s head (unlikely, but you never know). Based on percentage of use for it’s realistically valuable purpose, the retractable poles get my vote for convenience of carry (a Glock 27 also works). The basic way: If it’s handy, you’ll use it. Stow it in one of the forward pouches of your pack. The basic why: This is not absolutely necessary, but from the ground up, the hat goes on top. One with a wide brim will make you look like a fool, but if you’re willing to wear it, it will keep the sun from baking off your face. Your skin is craggy and wrinkled enough, by the way. Gotta go. My family is leaving for a quick, impromptu overnight hotel adventure as a reward for the kids’ outstanding report cards. Where’s my purse? Ah, here it is. My personal day pack is the Mountainsmith Tour TLS. 488 cu inches (8L). I have the red because that color stands out against the rest of my gear. It’s 11.5 inches wide, 10 inches tall, 5 inches deep. It fits into my larger backpack, so I never have to repack the the most vital contents. I just shove the day pack inside the backpack.